Japanese Episode 273: "Sayonara...Soshite, Tabidachi!" English Episode 611: "Gotta Catch Ya Later!" Now that the Silver Conference is over, Satoshi-tachi make their way back toward Masara Town. They stop by Tokiwa City on the way, and Kasumi is informed that she has an e-mail from her sisters. The e-mail informs her that they'll be leaving for a world tour, so she'll have to return to Hanada Gym to resume her duties as Gym Leader! The Tokiwa City Joi gives Kasumi her bike, now repaired, and so Kasumi reluctantly departs. Takeshi also informs the group that he needs to leave, so the three trainers each go their separate ways. The next day or so, Satoshi is at home and finds out that Shigeru is also leaving on a journey, so he rushes to catch up with him. Satoshi also discovers that Shigeru is only taking his first pokemon with him, so Satoshi decides that he'll do the same now that he's decided to go to Houen. He finds his ex-rival and gives the other half of the Monster Ball from their past and wishes him luck on his journey. After an attack from the Rocket-Dan, Satoshi tells his family and friends that he plans to go to the Houen region. After receiving new clothes and a boat ticket from his mom and a new Pokemon Zukan from Ookido-Hakase, Satoshi is ready for his new adventure! Hey, it's time for one of the biggest episodes in the entire series! Let's take a look at it, shall we? This is the episode where a whole lot happens. Kasumi finds out that she has to return to Hanada City, leaving the group for an indefinite amount of time. The Pokemon Saikyou BURAZAAZU (Pokemon Strongest Brothers) make their debut, showing us just how funny/annoying they can be. Takeshi also leaves the group, though for what reason we don't know. 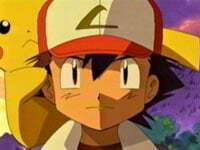 Satoshi decides to start his journey in Houen the way he started his journey in Kanto, with only his Pikachu by his side. And, on top of all that, Satoshi gets his new clothes and Zukan and ship ticket, all from his mom and Orchid-Hakase. It just seems like so much was crammed into this episode and, as a result, the pacing was really, really off. It feels like they tried to cram an episode and a half into one, and unfortunately it just doesn't work out. That's not to say that the episode was terrible--the episode had some of the best animation (if not the best) in the entire series, the music was (at least in the Japanese version) very appropriate, and the farewell scene was really nicely done. Really, if the episode didn't try to cram so much in such a short amount of time, this episode would easily be in my Top Five list. As far as the dub goes, it's pretty unremarkable except for one rather large edit. Other than that, we get a lot of "this is the last time 4Kids does this" or "this is the last time 4Kids does that" with this episode, from Takeshi's onigiri to Delilia's obsession with Ash's underwear. Daisy: "I came in third in a beauty competition, and I'm able to bring...two others!" Actually, according to the Japanese version, she won the tickets through a supermarket, not a beauty competition. But, y'know, since Daisy has the stereotypical airhead voice, they just had to have her win her tickets through a stereotypically airheaded method. For the big flashback of the episode, 4Kids pretty much threw out the Japanese flashback and created their own. In addition, they replaced the Japanese music - a fantastic piece from the second movie - with a brand-new vocal song, created specifically for the episode. *A new image of Satoshi, Kasumi, Takeshi, and Kenji created specifically for this episode. *A shot of Ash, Misty, and Brock walking through a blizzard in "Snow Way Out"
Goodbye, funny how thats such a hard thing to say. Now its time to let go but...never thought i'd feel this way. Promised not to be sad but...we both knew I was lying. Is knowing that I won't see you again. Both flashbacks are for the same duration (about 52 seconds), so 4Kids didn't change the flashback because of time issues. As far as I can tell, the main reason they did so was because they really wanted to play up the whole Ash/Misty romance angle. Usually 4Kids just changes a line of dialogue here and there to make scenes more Shippy, but here they went to the trouble of assembling a bunch of Ash/Misty scenes (and even creating new ones, like the split screen one) to make it look like Satoshi and Kasumi were meant for each other. Personally, I don't like the dub flashback because it's too narrow in that it only focuses on Misty's relationship with Ash. The Japanese version had more of a focus on Kasumi as a trainer and as a friend and didn't limit her character to nothing more than a romantic lead, but that's just my opinion. For all you non-dial-up people, I've taken a bunch of screenshots from the Japanese flashback, so click here to view them. We can't have the series end without calling onigiri something else, now can we? Brock: "It must be the onion...making my eyes water." Of course, we all know that the food that Takeshi likes to make all the time is really an onigiri. I think that, at this point, 4Kids is purposely giving the food as many different names that they can come up with, and I really get the feeling that they think of it as some sort of running gag. What will it be called next week? Or the week after that? Or the week after that? You'll have to tune in to see! Right after the above line, Satoshi is running and crying right before the show goes to commercial break. The shot of him running gets four seconds cut off from the end. The shot of Satoshi looking over the plain after getting out of the Rocket-Dan's trap (it's right before the last commercial break) is shortened by five seconds. I guess 4Kids think kids don't have the attention spans or something. Ash's Mom: "Brush your teeth, and change your underwear!" Underwear isn't mentioned at all in the Japanese version. To this day, I've never understood why 4Kids decided to make Delila some sort of underwear-obsessed freak.